When you’re looking for great edtech tools to use in the classroom, where do you turn? If you’re fortunate, you have a circle of trusted colleagues who can provide recommendations and advice. Common Sense Education can also be a trusted resource for you. We provide unbiased ratings and reviews of edtech for educators and provide a home to a community of teachers who can support each other in integrating classroom technology effectively. 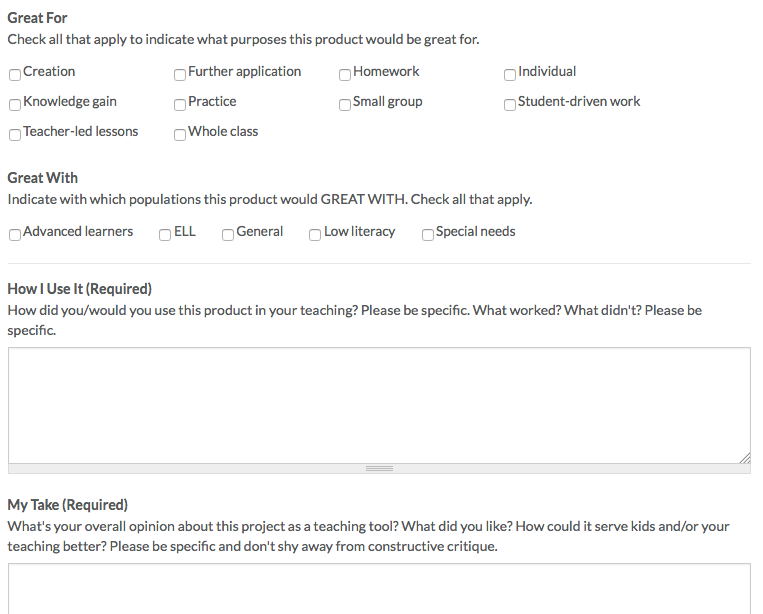 On Common Sense Education, a team of expert educators use our research-based rubric to create Editorial Reviews of products, then teachers like you can add their own Teacher Reviews as well. That way, you can both access and contribute free advice for using apps, games, and websites in the classroom. We invite you to start contributing your insights and be a part of building something great. But how do you write a great Teacher Review? Teacher Reviews provide an opportunity for educators to describe their experiences using an app in the classroom and to share their insights about what worked and what didn’t. The teacher rating of an app is an average of all the ratings from the Teacher Reviews for that tool. Teacher Reviews can vary in length. Some are quick snapshots, while others provide rich descriptions of how an app or website helped a teacher realize specific learning goals. Teacher Reviews that provide specific examples of student experiences and outcomes are most likely to be useful to other teachers and deepen the conversation around integrating technology into the classroom. Here’s how you can join in. Sign in or sign up for Common Sense Education. It’s free. Find the Editorial Review of an app, game, or website you’ve used in the classroom. Click on the blue and white “Write Review” button above the images in the top right. A pop-up will appear with a form for you to complete. Write a compelling headline. It should be a snapshot of the product or its uses. It can be a sentence or phrase. Convey the gist of your evaluation and rating; the reader should know why you rated the product 5 versus 1, or ways it could be used. Engagement -- Do students want to repeat the experience or do they lose interest quickly? Pedagogy -- Does the tool build deep understanding about lasting concepts or provide only a superficial survey of content? Does it require critical thinking? Support -- Are there resources to extend learning beyond the tool, and supports for different kinds of learners? The Overall Learning Rating (1-5) should be a reflection of all three of the dimensions. How did you use this tool in your teaching? Provide specific examples. Who did you use the tool with, for what purpose, and in what setting? What were the specific takeaways for your students? What is your overall opinion about the app as a learning or teaching tool? How could the tool better serve students and/or your teaching? Be specific, and don't shy away from critique. You'll also be asked to indicate which purposes and student populations the tool is best for. We hope you'll add a Teacher Review today. Which are your favorite Teacher Reviews? Do you have tips for how to write a good one? Add a comment below!